The Northeast is known for its Nor’easters and snowy winters, but as climate change brings more extreme weather events with severe cold and worse snow storms, the average expenditures for all major heating fuels has been on the rise. The Energy Information Administration (EIA) projects natural gas expenditures to rise by 12 percent, home heating oil by 17 percent, electricity by eight percent, and propane by 18 percent for the coming 2017-2018 winter. Most of the increase reflects expected colder weather rather than higher energy costs. As extreme weather events bring colder days, consumers are turning their thermostats on earlier in the season, to higher temperatures in order to create more comfortable indoor spaces. This is creating peak demand periods in the winter. This leads to constrained heating oil and natural gas markets. The Northeast is unique compared to the rest of the country because a vast amount of fuel oil, in addition to natural gas, is still used for heating homes. In recent years, when demand for natural gas used for space heating increases, natural gas pipeline capacity grows more constrained for gas supply to the electric power sector. This combination of weather-driven demand spikes plus low inventories has led to dramatic gas price increases that foster distillate demand for use as a substitute fuel at gas-fired power plants that have the capacity for fuel-switching. These fuels come with environmental consequences of increased carbon, negative health impacts, and potential environmental degradation from leaks and spills. With continued use of these fuels and increased demand for them, the region may face amplified challenges in reaching carbon reduction goals, unless action is taken to improve the energy system in the winter. In the winter of 2015, the Northeast experienced extreme cold and record snow fall. I remember this winter vividly; the pipes in my Worcester apartment froze and I didn’t have access to water for a couple of days. I wasn’t the only one with operational problems though. Regional refineries had issues, regional railways were interrupted, and frozen rivers and waterways that transported heating oil made it much more difficult for fuel to reach its destination. With increased winter demand creating tension between heating fuels and electric power generation, and access to fuels being hindered by weather, it is more important now than ever before to increase winter electric and gas energy efficiency programs. The pie chart below represents which types of programs are currently contributing to winter demand savings. In order to achieve the demand savings represented, utility programs and incentives are put into place to engage customers in energy efficiency, whether through behavioral programs or retrofits, to button up the building for winter weather. These programs help customers reduce energy costs without sacrificing comfort during the winter season. Each sector offers a number of different program types. As shown, retrofit programs provide the most savings for commercial and industrial, and residential customers. 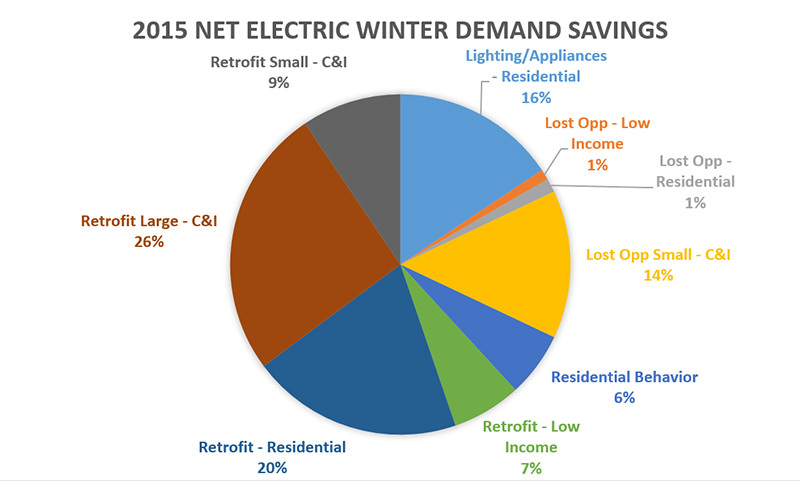 Commercial and industrial retrofit programs contribute a significant portion of winter demand savings. One of the programs that has been quite successful is Connecticut’s Energy Opportunities program. This program offers technical assistance to identify opportunities for energy savings through the replacement of functioning electric- and gas-operated equipment with energy-efficient upgrades. The program offers zero- or low-interest financing and/or cash incentives of up to 40 percent of total installed cost. Programs that use advanced metering infrastructure and time-vary rates can incentivize customers to shift load-intensive activities to off-peak hours through pricing signals and alerts about peak events from the utility. Actions such as turning the thermostat down a couple degrees during an event or washing clothing in cold water can make a big difference during peak events in the winter. 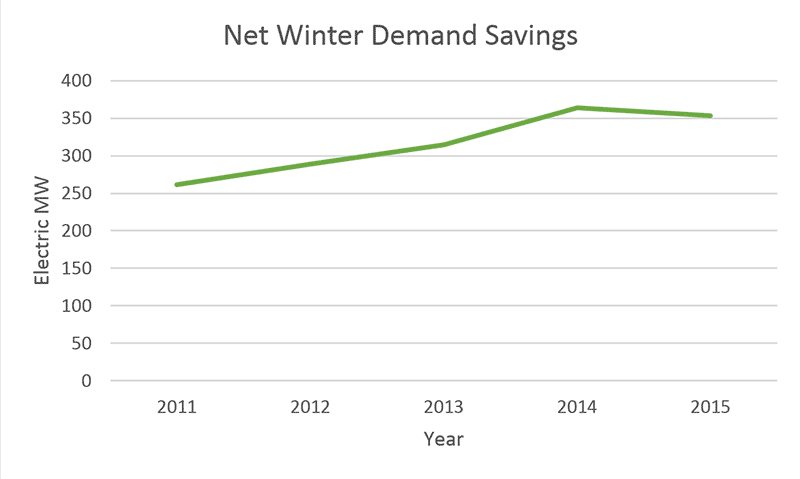 The graph below shows net winter demand savings reported to NEEP’s Regional Energy Efficiency Database (REED) since 2011. Not all states have reported winter demand savings, which speaks to the need to attribute savings to winter demand and further develop programs in this area. These programs have been successful in reducing demand, but in order to mitigate the environmental impacts of fuels used for space and water heating, the region will need to electrify end uses and expand these programs even further to account for additional load. Strategic electrification will move us away from relying on fossil fuels to power our water and space heating systems and ultimately increase energy efficiency and reduce pollution. Policies and plans to help states in the region move toward strategic electrification are under discussion by various stakeholders. As envisioned, it will hopefully provide an integrated approach to deep decarbonization while lowering costs to customers and society. During this transition, there will be a seasonal shift in peak demand for electricity from summer to winter, which will necessitate further development of utility programs for winter demand. Reducing space heating load through efficiency, including deep energy retrofits in existing buildings and construction of zero energy homes, is a complementary strategy to strategic electrification in buildings. While electrification may increase electric load, it can also advance efficiency in the region by powering end uses, such as vehicles and space and water heating, with electricity at significantly higher efficiency. Electrification technologies such as air source heat pumps (incentivized by many utilities)and electric vehicles also have the ability to respond to grid signals, which makes them prime candidates for demand response programs. This will help alleviate some of the winter hurdles we currently face in the winter, such as higher gas prices and constraints on fuel oil supply. Two states in the region, Massachusetts and New York, are currently exploring various innovative demand reduction strategies as well. Massachusetts has committed to explore creative new approaches to cost-effective demand reduction, beyond the demand savings through energy efficiency programs in the 2016-2018 Three-Year Plan. Specifically, Massachusetts aims to achieve 577 MW summer demand savings and 618 MW winter demand savings. Since winter demand reduction opportunities do not have as much discretionary load, fuel switching provides an avenue for winter demand reduction programs. Massachusetts has also examined how energy storage can help meet winter peak demand. Energy stored during off-peak hours can be deployed during on-peak hours to reduce the need for backup generators and the need for fossil fuels. Storage, co-located or coordinated with a gas generator, can be dispatched to work with wholesale markets to improve the efficiency of generators and help meet demand requirements. This winter, National Grid and AutoGrid are partnering to reduced natural gas peak demand with some of the same types of solutions that have been used for electric demand reduction. Under this pilot, C&I customers in New York City and Long Island have volunteered to have boilers, heaters, and other natural-gas-fired equipment attached to load control devices from vendor IPKeys. AutoGrid will then be able schedule and control the equipment during the cold winter mornings when natural-gas heating demand peaks. There is, however, still much work to be done in deep energy retrofits to get buildings ready for winter. By providing building retrofits and fuel-switching to electrify the heating system, the region can curb winter demand and reduce carbon emissions all at once. Deep energy retrofits can save a significant amount of energy usage in a building by comprehensively addressing energy loads. By incorporating efficient lighting, appliances, and other plug loads into an insulated home, with efficiency space and watering heating systems, one building can truly do a lot to reduce winter demand. While acknowledging that these changes won’t happen overnight, it is also important to acknowledge the progress utility programs have made thus far in reducing winter peak demand. There is opportunity to alleviate the burden of extreme weather events in the winter by electrifying heating systems and exploring opportunities that other technologies, like storage, can provide to create an integrated solution.